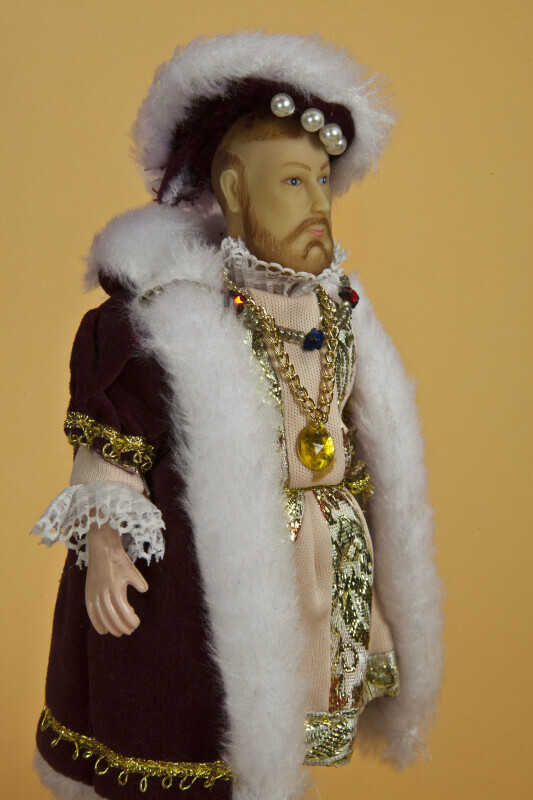 Figurine of King Henry VIII. His head and torso are made from rubber, and he has plastic arms and legs. He is wearing a red velvet hat with white fur and pearl trim. His coat is also red velvet with white fur, and it has gold trim. Henry has a medal on a gold chain around his neck, and a sword on his belt. His tunic is made from a beige knit, with a lace collar, and it is trimmed with metallic ribbon. His knickers match his tunic, and he is wearing white knit stockings. Stand says "Six times married in search of a son and heir to the throne of England." The figure is 10 inches (25 cm) tall.